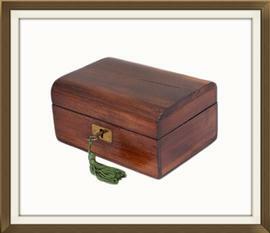 This is a charming small, pine jewellery box, dating to 1890/1900. Its exterior has been refurbished by our wonderful restorer, and is newly French polished and stained. There is some beautiful characteristic figuration to the pine, particularly on the back of the box. The interior is complete with its original storage tray. This has beautiful silk and velvet linings, of a lovely teal green shade. 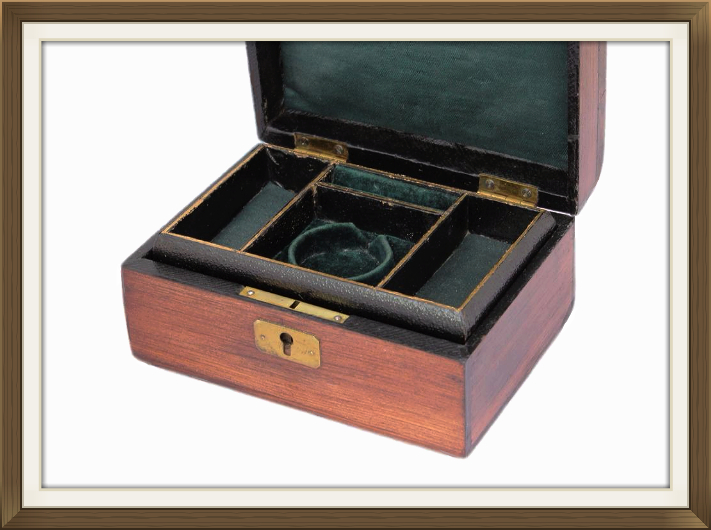 The tray has multiple different sized compartments, and a lovely little ring storage section. Its centre front compartment was originally designed to hold a pocket watch, and would now be ideal for a beautiful pendant or locket. The tray's exterior has a leather finish with embossed gold detail. The inside walls of the box are also finished with leather. Beneath the tray is a larger compartment with a beautiful padded silk panel in the base. A matching silk panel is within the inside of the lid. 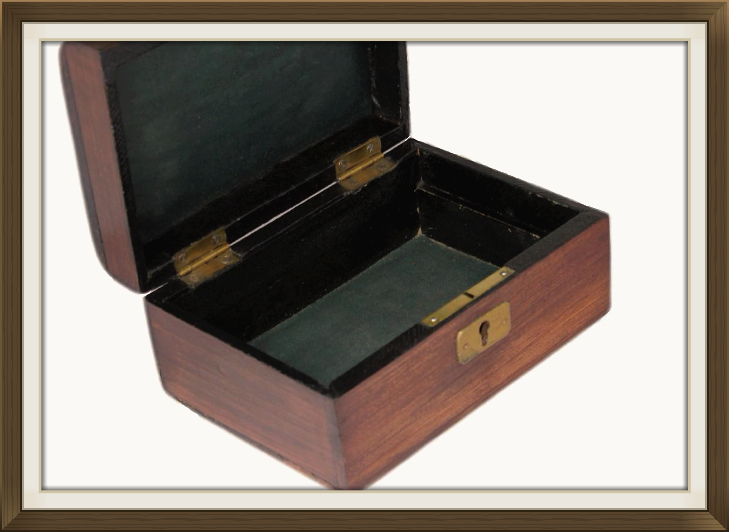 The box is complete with its original brass stop hinges, brass lock, and key. There is a decorative brass escutcheon to the keyhole. 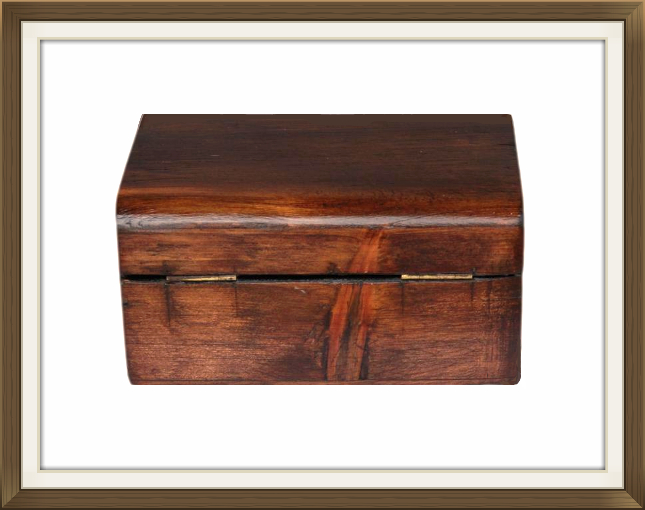 This charming little box is in lovely condition for its 100 plus years of age. There are a couple of fine surface lines upon the lid which are consolidated and do not run deep into the pine. These do not spoil the beautiful appearance of the box. There is some light tarnish and light surface wear to the brass escutcheon, and some wear to the leather cover on the base. This is an original feature of the box, and as most of it is intact, we decided against replacing it. 7.3 by 3.1cm with a 2cm depth. 5.5cm square with a 1.5cm depth. 3.5cm diameter to centre circle compartment. This box will be posted, FREE within the UK, by Next Day Special Delivery. International postage is just £25, delivered fast within 5-7 working days.